Points of Light, the largest national nonprofit dedicated to increasing volunteerism, mobilized people across the nation to transform veteran’s homes in Phoenix, complete school makeovers in Los Angeles, repair communities impacted by Hurricane Sandy in New York and more. Their signature event was in Washington DC, the largest single-site service project of the inaugural weekend, which was made possible by Target, as they give 5% of their profit and thousands of volunteer hours to communities every day! Vice President Joe Biden and his family joined 10,000 volunteers and Homeland Security Secretary, Janet Napolitano, in Washington D.C. to put together 100,000 care kits for U.S. military personnel, disabled veterans and civilian first responders. In the Vice President’s remarks thanking the thousands gathered for donating their time, he stated, “Dr. King imbued in the public this notion of absolute service,” and noted that it was this legacy of volunteerism and service that have continued. 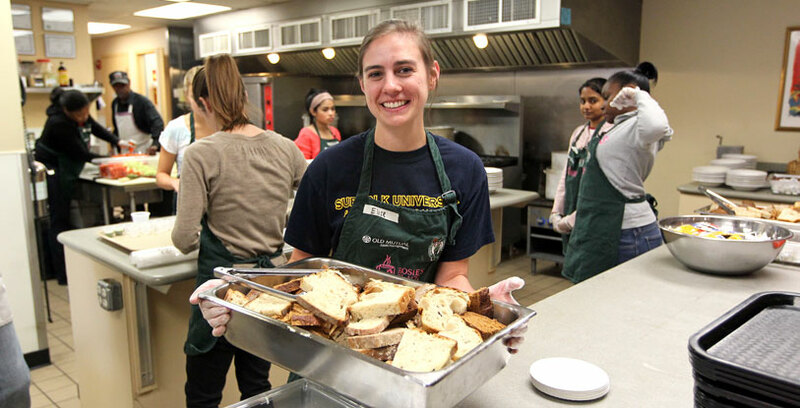 Suffolk University student, Elise Kapitancek volunteers at Rosie’s Place. At Suffolk University, groups of students volunteered at Rosie’s Place and Boston Rescue Mission. Rosie’s Place serves lunch and dinner to over 300 women and children per day, and provides guests with assistance finding housing, medical services, education, employment, legal advice, and transportation. The Suffolk student volunteers helped Rosie’s meet their goal of 60,000 hours of volunteer-provided service! Boston Rescue Mission feeds and shelters thousands of Boston’s homeless every day. The Mission strives to create a community unlike a typical overnight shelter. It is the goal of their program to teach each individual to become self-sufficient, hold a job, find their own place to live, and contribute to their community. In Cambridge, the AltruHelp team joined Many Helping Hands and volunteers of all ages to participate in hands-on service projects like sewing fleece scarves and blankets for homeless individuals, making Valentines cards for the elderly and veteran population, creating activity kits for children waiting in hospital emergency rooms, designing bookmarks for literacy programs, and sorting donated food, books, and winter clothing. 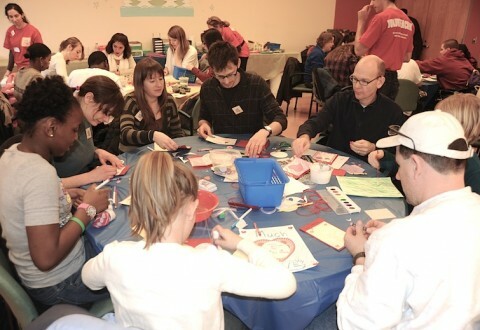 Volunteers at Many Helping Hands’ MLK Day of Service make Valentines for senior citizens. Students from Northeastern took park in a day of workshops and service projects at the Curry Student Center. Entitled “The King Day of Service and Leadership,” the event hosted both students and local teens at workshops focused on leadership, conflict resolution, community building, healthy relationships, and food justice. Service projects included painting murals, writing letters to soldiers, and more! Each of these large scale events are held annually and the participating non-profits are always seeking more volunteers. If you want to get more involved in your community, sign up on AltruHelp.com to connect with meaningful volunteer opportunities near you and other people who share your values. 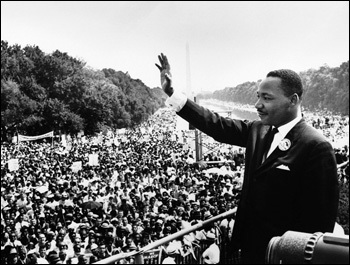 In the words of Martin Luther King, “Everybody can be great…because anybody can serve. You don’t have to have a college degree to serve. You don’t have to make your subject and verb agree to serve. You only need a heart full of grace. A soul generated by love.” – Martin Luther King Jr. It was wonderful to see so many people giving their services to those who need it without expecting anything in return.